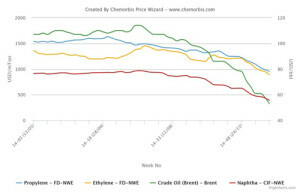 The European PVC market is tracking a stable to slightly firmer trend this week as some buyers managed to pay rollovers on their December deals after negotiating, as reported on www.ChemOrbis.com. Expectations are shaping up for January and they are mostly dampened by the losses in the upstream markets. 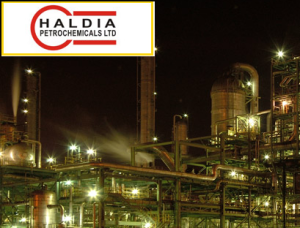 Spot naphtha prices are still weak, remaining below US$400/ton on a CIF NWE basis, as Brent crude futures fell to a 7 year low during intraday trading on December 14. 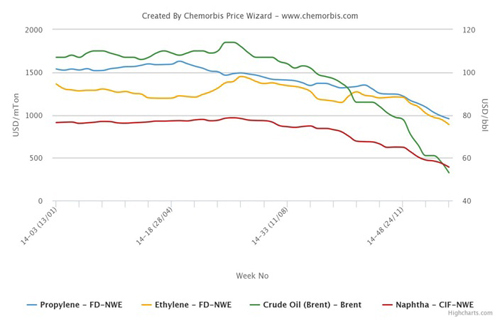 Spot ethylene prices also lost ground following restarts at Shell’s Moerdijk, Netherlands and Wesseling, Germany crackers. A compounder in Italy bought West European PVC with rollovers from November and reported receiving some other offers with slight increases of €10/ton for the same origin. The buyer expects to see decreases in January considering the losses in the upstream markets. Another compounder reported receiving December PVC offers with slight hikes of €10/ton from his West European supplier. “We haven’t contacted other suppliers since we will buy limited volumes this month as we don’t want to build stocks prior to the end of the year. For January, increases are unlikely as crude oil and naphtha prices are quite low,” the buyer commented. Meanwhile, both buyers reported receiving import US PVC offers for January delivery at levels around €90-100/ton below the lowest European PVC prices in the local market.